The most useful thing you can make for your routing is a pattern of your router base in 9mm or 12mm MDF. 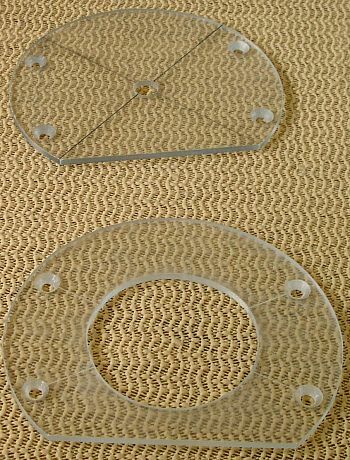 If your router has a removable sole plate, take this off and use it as the original pattern. If not, take a paper rubbing of your router base to establish the position of the fixing holes, drill the holes, fasten the MDF to the router and draw round the base. Remove the MDF and cut or sand to shape. Nearly all the false bases you make from the MDF pattern will require a suitable cutter aperture accurately centred. An easy way to achieve this is to use a set of hole cutting saws. Fasten the false base to the router, insert a straight cutter of the same diameter as the drill on which your hole saws are based, and plunge this cutter through the false base. This will give a pilot hole of the correct diameter and dead centre. Remove the false base and cut the aperture with the appropriate size hole saw. 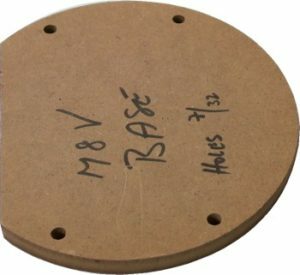 From the MDF pattern you can make a large number of false bases for various specific purposes. Examples include bases with different size apertures to suit different diameter cutters for edge moulding, flush trimming, housings, drilling, etc. 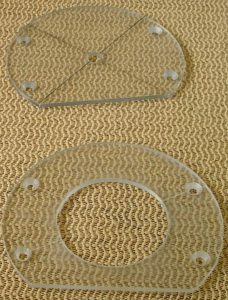 You may find that your local independent DIY shop has a stock of offcuts of perspex or polycarbonate big enough for router bases. That is how I get mine, in exchange for a donation in the local Hospice box.